We've reached the end of the regular season. This championship bracket is the last chance to score points before we crown a winner. This bracket will feature all eight regular season winners. Be sure to join us for season 2 with 32 new cars to be raced. Here is the line-up for races in the championship bracket of the Hot Wheels Fantasy Pick'em game. Well, there you have it! Nitro Tailgater and the Corvette coming down to the wire with a photo finish. All the Corvette Grand Sports I've had have been quite speedy, but I thought the Nitro Tailgator definitely had it's work cut out for it. However, my sister had a 2015 Nitro Tailgater that was pretty fast last year, so I knew it had potential. In the end, it was the electronic finish line that declared the winner as it was too close to call with the naked eye. 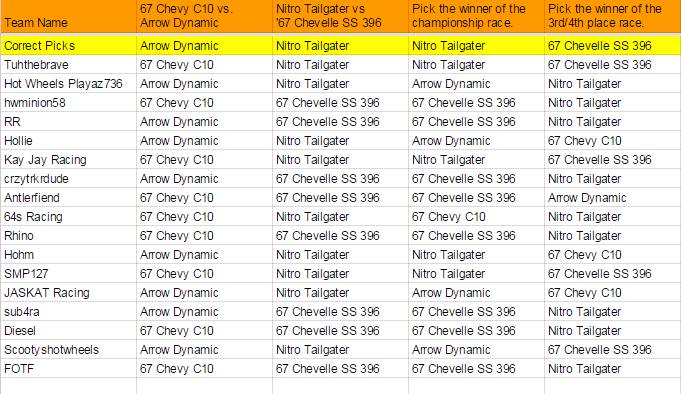 Out of the 32 cars raced in Season 1 of the Hot Wheels Pick'em game, Nitro Tailgater turned out to be the fastest! The Team standings also came down to a photo finish. Heading into this final bracket the top of the standings were pretty tight, but with extra points up for grabs, it was anybody's game. Hollie made a late run winning the bracket and missing only one pick, but it was ScootysHotWheels with a big bracket this week to pull out the come from behind win and claim the top spot in the standings for Season 1. Congratulations ScootysHotWheels! You can check out the complete standings HERE. Season 2 of the Hot Wheels Pick'em game will be starting soon. We'll take a week off and then be back at it with the first races posted on March 19th. In the meantime, buy some cars, do some testing and we'll see you soon for Hot Wheels Pick'em! 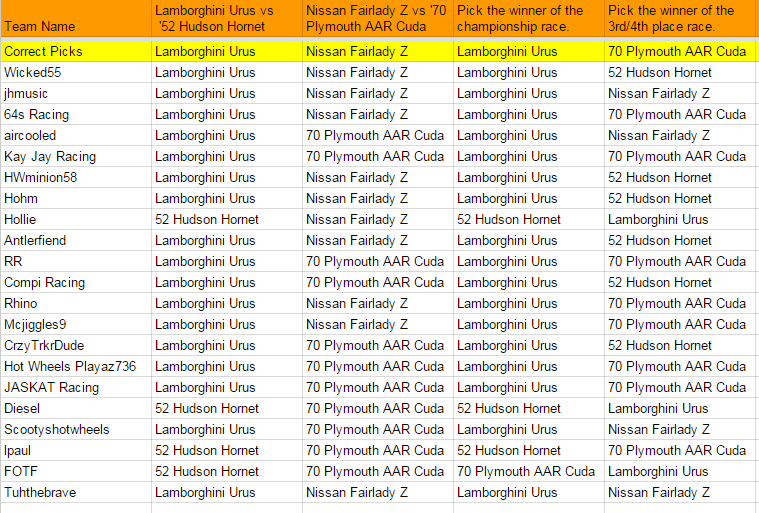 Here is the line-up for races in week 8 of the Hot Wheels Fantasy Pick'em game. These are the last regular season 1 races. Next week we will have a final race bracket featuring all eight regular season winners. But more on that next week here are the cars for this week. Both the Hudson Hornet and the Plymouth Cuda suffer from a problem we've seen with other cars we have raced. Their wheels are set in so that the body of the car rubs on the side of the track. Both had nice smooth rolling wheels, but because the body rubbed on the track, they were both slowed down considerably. Team Standings can be found by clicking HERE. See who is racing and make your predictions for the championship bracket by clicking HERE. So you got a race coming up and your looking for the fastest Hot Wheel car. 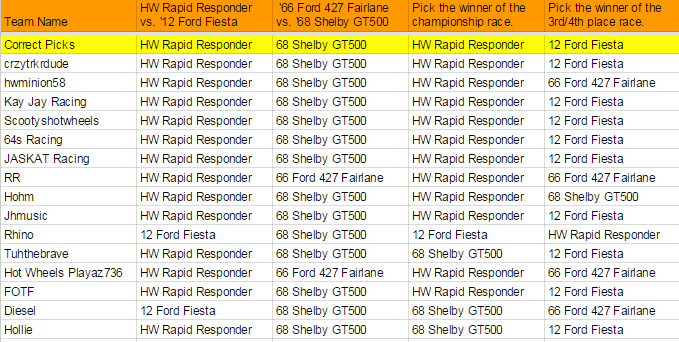 If you have one of this 5 cars in your collection you'll have a good chance of winning. It's very had to say what the fastest Hot Wheels car is, because there are some variables that aren't consistent from car to car. Sometimes you just have to get a bit lucky and get a good pair of smooth, straight axles and nice, perfectly round wheels. Not all cars come from the factory that way, although to look at them with the naked eye it would appear so. That being said, there are some castings that are consistently fast, and below are 5 that every serious racer should have. There is some debate as to which Ferrari F40 is the fastest but if you stick with one put out in 2000 or before you'll have a pretty decent car. The ones I've seen raced with success most often are the gold one pictured below, the yellow one from 2000, and the red ones from the mid-90's. Don't mess around with the later F40s as any new ones are lighter with plastic parts. The Ferrari has good weight that is distributed well. It's low, wide stance helps it run straight and true on the track. The Probe Funny Car is a heavy car, so if physics and potential energy have anything to say about it, this should be a fast car...and it is. There are of course different versions of this car, but the one that I've seen most serious racers use is the yellow and black version from 1999 pictured below. You can't go wrong with a good set of 5 spoke wheels. The Way 2 Fast is our next car and can be a very fast car. Especially if you get the Faster Than Ever (FTE) version. Faster Than Ever refers to the type of wheel, and more specifically the axles. The axles are nickel-plated to reduce friction and increase the car's speed. They work too. Faster Than Ever cars are generally faster than their non-Faster Than Ever counterparts. Faster Than Ever cars always have bronze open hole 5 spoke wheel. They have been produced off and on since 2005, but the 2005-2006 cars seem to be the best. This Way 2 Fast with Faster Than Ever wheels is a great car for racing. Even though it's not as heavy as some of the cars on this list, it's FTE wheels and long wheel base are a great combination for speed. Having most of it's weight in the back increases it's potential energy and helps it's performance. And hey, it has 2 engines so it's got to be fast! Even though this car is the lightest on the list it is very fast. You want the Faster Than Ever version from 2005. This car has a very long wheel base and a nice wide stance. It's low center of mass, weight distribution, and aerodynamics all add up to make the perfect car. If this car weighed more it would easily be the fastest car Hot Wheels makes. Still, as it is, very few cars can beat this car. This car was part of the Pro Circuit series and came out in 1992. It's not super common and a little tricky to come by, but this is a VERY FAST car! 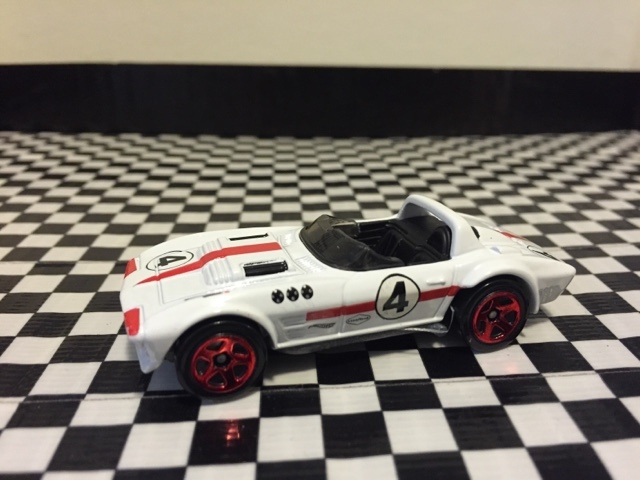 It has a long wheel base, good weight and wheels that are very rare on Hot Wheels cars. If you look close you notice that the axle doesn't come all the way through the wheel. There is a "cap" on it. These wheels are similar to what you find on a lot of Johnny Lightning cars. All of this works together to make this on of the fastest stock cars that I own. 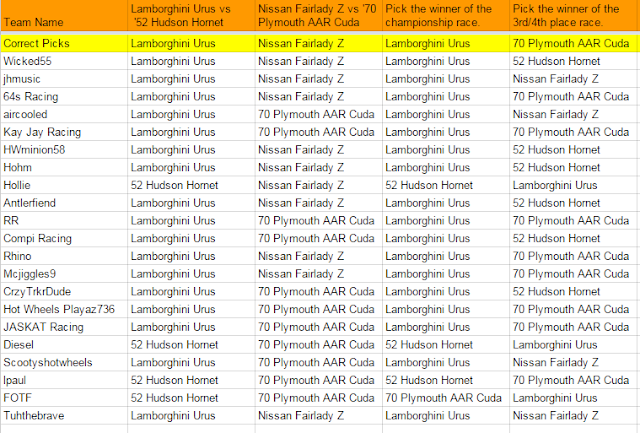 Here is the line-up for races in week 7 of the Hot Wheels Fantasy Pick'em game. You can join in at anytime, so even if you haven't picked in previous weeks, make your picks and have some fun. Team Standings can be found by clicking HERE. See who is racing and make your predictions for week 8 by clicking HERE. Here is the line-up for races in week 6 of the Hot Wheels Fantasy Pick'em game. You can join in at anytime, so even if you haven't picked in previous weeks, make your picks and have some fun. Team Standings can be found by clicking HERE. See who is racing and make your predictions for week 7 by clicking HERE.